“Violet, this is going to be awesome. You’ll see,” Grandma Daisy cried as she wheeled an over-full cart of books in front of Charming Books’ front window. In my experience any time my seventy-something grandmother says, “This is going to be awesome!” I was in some serious trouble. Faulkner, the shop crow, seemed to agree with me because he leaped from the sale counter and flew to the very top of the birch tree that grew in the middle of the shop. My tuxedo cat Emerson, however, sat at my grandmother’s feet with his thin black tail swishing across the hardwood floor. If Emerson and Grandma Daisy teamed up on this “project,” I was really in trouble. “Grandma, what is going to be awesome?” I asked, trying my best to sound supportive and upbeat. I failed miserably. “We, my dearest grandchild, are going to build a book tree!” She proclaimed as if she were announcing the President of the United States. “I’m your only grandchild,” I said automatically. I shrugged. “I’ll help.” I didn’t have a choice, not really. Grandma Daisy was going to build a book tree whether I went along with the idea or not, and it was best that I helped so that the tree would be stable and didn’t crush any unsuspecting customers while they shopped. Hours later, Grandma Daisy and I went outside of the shop. I carried Emerson in my arms, and Faulkner perched on her shoulder. Together, we admired our book tree. Grandma Daisy had been right. It was a good idea, and it could be seen all way from the street. Our little family of four stood there admiring the tree and the shop. It would be a very happy Christmas now that I was back where I belonged in Cascade Springs. What’s your favorite holiday tradition? Leave your answer with your email address in the comments and enter to win a signed cop of Murder, Served Simply. Contest ends on Sunday, December 4th at 12pm EST. US and Canadian residents only. Thanks! 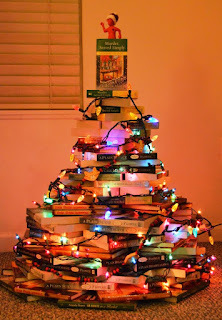 WATCH VIDEO OF HOW TO MAKE A BOOKS TREE! Buy a mystery and help feed a community! 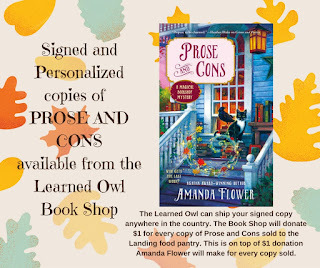 Purchase any edition of Prose and Cons book, between now and Tuesday, December 20, 2016, and Amanda will donate $1 for every book sold to a food pantry, The Landing, located in Akron, Ohio. The Learned Owl is also making a $1 donation to the Landing for every copy the bookstore sells and is selling PERSONALIZED AND SIGNED copies of the novel. They can ship anywhere. I forgot to say that my favorite tradition is going in a circle one at a time and opening gifts. I love my family and watching their faces makes me happy. Lots of traditions, from decorating to baking to reading The Night Before Christmas on Christmas Eve (even though everybody is grown up now) but I think maybe making a book tree will become a new tradition. Thanks for the giveaway. We always read The Night Before Christmas on Christmas Eve. When the kids grew up and left home the book was put in their Christmas boxes, taken along on visits, and even read over the phone! Often it is now emailed. We have stocking gifts saved for after dinner. ANdmlet's not forget our Christmas pickle. Our favorite tradition is the feast of seven fishes. Our Italian American family has been doing this every Christmas Eve since before I was born. The two traditions our family has kept faithfully are the watching of the Christmas specials (Rudolph, Frosty, Charlie Brown, the Grinch, etc) and the music. We go nuts once we start hearing Christmas music. Thank you for the chance to win. closet once the holiday season is over. Dread that part. The book sounds like a great read. My favourite Christmas tradition is being with my family and opening presents at midnight so then we could sleep in! One of my favorite traditions is Christmas Eve dinner at my parents house. So festive and joyful! Thanks for having this awesome give-away! As a child we would get out our xmas box the day after thanksgiving and it would stick around through xmas. Inside it had special xmas coloring books and xmas books collected since birth. It was always so fun to see those books each year and remember the past christmases. Even though my son isn't even two yet I've already begun his xmas box. Right now it's all board books but he has enjoyed looking at them and in a few years it should be pretty stocked. Thanks for the fun! One of my favorite traditions growing up was Christmas eve dinner at Grandma Simmons' with all the family. One night I remember we were later than usual going home and I was looking out the windshield watching all the way home for Santa and begging Daddy to please hurry..I was so afraid he'd come before we got home! I love making cornflake cookies & other treats with my family. Thanks for the chance. I love watching the little ones open their presents. Watching Christmas movies on T.V. and getting presents. I enjoy some Christmas music too. Eating turkey and pumpkin pie. 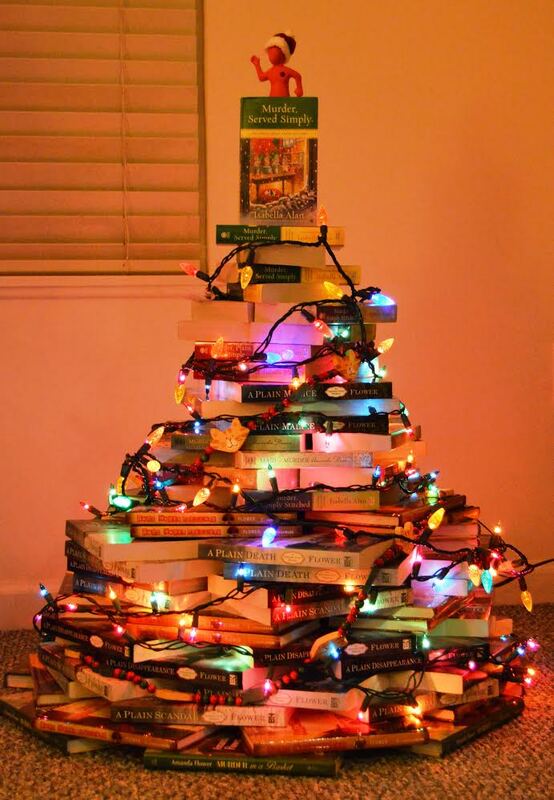 The tree is a great idea, especially for a bookstore. But what if you want a book that's on the bottom? My favorite tradition is putting up the Christmas tree with my sister and trying to get the ornaments in just the right place on the tree. After we trim the tree we like to sit in the dark and admire the tree lights in the dark. My favorite tradition is baking cookies with my children when they were young and now with my grandchildren. One of my favorite traditions is to go one morning to a local candy shop and buy their homemade ribbon candy. I usually also get some red licorice and a plushie as well as chocolates for gifts. Watching the movie White Christmas and driving around our community to see the Christmas lights are two of my favorite tradition. One of our traditions is Christmas music starts the day after Thanksgiving. I listen to all kinds. Now I need to get my Christmas letter done so I can get my cards sent out. I just love decorating the tree. There are so many memories attached to those ornaments. My favorite Christmas tradition happens on Christmas Eve. After Christmas service, we attend a live Nativity reenactment and then return home. Once home we read the PA Dutch Night Before Christmas by Chet Williamson. It is a parody of Twas the Night Before Christmas. It is told in the PA Dutch style and is absolutely hysterical to us! I love to see my grandson's faces on Christmas morning. One of my favorite traditions is attending Christmas Eve service. Usually it is an early service, but I really enjoy one when it is closer to midnight. Favorite tradition Christmas Eve dinner with extended family & friends.